33rd Annual Chowder Cook-off With A Twist! 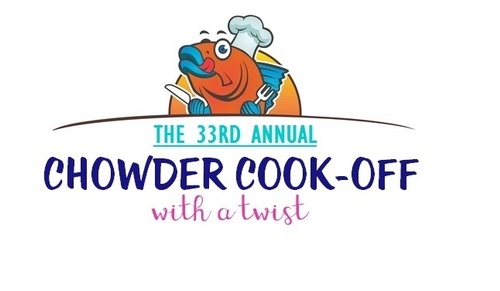 Name: 33rd Annual Chowder Cook-off With A Twist! Join us on February 2nd, 2018 at Port Canaveral Cruise Terminal 1 for the 33rd Annual Chowder Cook-Off with a Twist! This not to be missed event features top area chefs and restaurants competing to determine who has the best 'chowder' and best food 'twist' on Florida's Space Coast. Introducing the Chowder Connoisseur ticket option. Limited to 100, the Connoisseurs will enjoy early admission at 5pm, a lounge for relaxing, passed hors d' oeuvres, a signature welcome cocktail, separate entrance into the new Rising Tide Tap & Table craft beer garden, two drink tickets and the chance to win a Caribbean cruise. VIP tickets at $40 each, provide early entry at 5pm to feast on fabulous chowders and yummy 'twists', one drink ticket, and the chance to bid on the impressive silent auction items before the crowds hit. $50 at the door. General admission tickets with entry at 6pm are $25 in advance and $28 at the door. Panama Band will entertain, guests will browse an expanded silent auction, more restaurants than ever, a panel of celebrity judges and many more surprises both inside and out. For more information on this great community event, please call (321) 784-6444 or (321) 459-2200. Chowder Connoisseur & VIP ticket holders enter early at 5:00 p.m.